Risky choice: Bringing food to the dog park. I once saw a couple enter the dog park with their dog and a full-blown picnic, cooler and all. What a terrible idea! Many dogs are highly food- motivated (I have a chow hound of my own) and are perfectly willing to dive into battle over a dropped chip or half a liver treat. If you have food, your dog may feel obligated to go into resource guarding mode to protect what is “his.” I’ve occasionally gone to the dog park with forgotten treats in my coat pocket and it never takes too long before noses start to poke at me, begging for the food. The dogs always know. Leave the food and treats at home. Risky choice: Small dogs in the dog park. This is on my mind because of a recent incident. I was at the dog park when a person entered with a teeny, tiny puppy, barely bigger than my hand. She then proceeded to take out a squeaky toy and played with the puppy. My big dog heard the familiar SQUEEKY SQUEEKY and launched to get it – straight at the puppy. She heard the toy noise, saw the puppy skittering around, and immediately concluded the puppy was a toy. Fortunately, she pulled up at the last second when she realized her mistake and no harm was done (except to my nerves). Not every dog would have stopped and this story could have had a terrible ending. Speaking as the owner of a large dog, I understand that it can be frustrating that your little guy can’t be safe at the dog park. But the reality is that dogs are prey animals and no matter how vigilant you are, dogs are faster. Don’t let what should be a fun day end in heartbreak. Use the small dog area if your dog park offers one, or take advantage of a well-run doggie day care or training class for your small dog’s socialization and exercise needs. 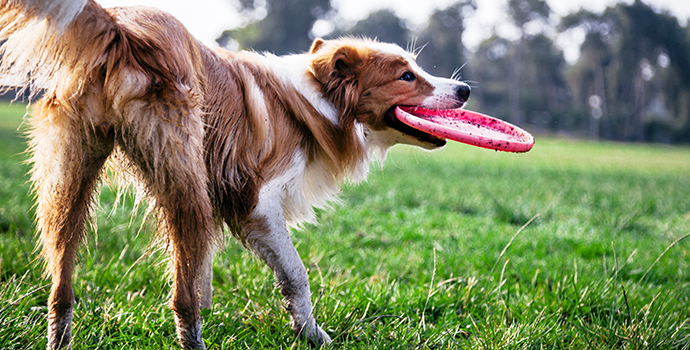 Dog parks can be great fun for you and your dog. I never tire of meeting dogs of every shape and size and have enjoyed learning about the many different breeds and unusual mixes I’ve encountered. And I also love that my dog gets her exercise the easy way! And speaking of exercise, don’t forget your Terry Naturally Animal Health Joint & Hip Formula. It contains a proven curcumin from turmeric combined with boswellia to ease joint stiffness and keep your dog’s joints healthy so she gets the most from her dog park experience. It is formulated in a beef-flavored chewable tablet dogs love, so you’ll want to leave the bottle at home.See you at the dog park!